It's a big ol burger!! 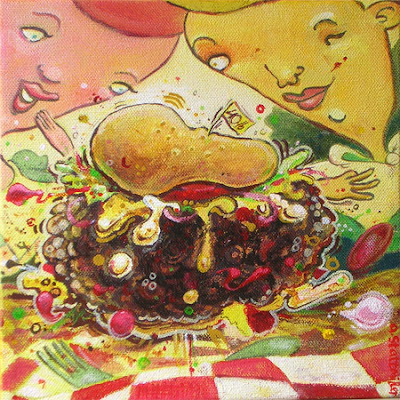 Well I got the paints out once again to illustrate what I like to call "the most fantastic event to ever set forth upon this great nation of ours-the 'Big Burger Challenge". Every July in Hormpstown USA, people of all ages, sizes, and races gather in TOWNE PARK to see who can scarf down the BIGGEST of all BOVINE (sandwitches). The competition lasts for hours on end, until at least four individuals are carried away and set aside on cotts in the direct afternoon sun. Nobody is declared a winner unless somebody's torso explodes. You might be thinking "If your torso explodes, you would die, there for you would be the loser". You thought wrong. It's a tradition worth torso explosion. No questions, youre either in or your not.